At the touch of a button, the bath lift will lower you TO THE VERY BOTTOM OF YOUR BATH and then raise you back out again when finished bathing. The seating band can then be retracted back into the wall mounted unit, freeing the bath for other users. The Bath Belt is available with an adjustable BACK REST which gives support when getting onto the belt and lowering into the bath. The BACK REST is adjustable and when it is moved to the back of the bath, it can be used as a headrest. Thermometer: The unit has a thermometer to test the temperature of the water. Power: Two 12 volt rechargeable lead acid batteries provide a 24 volt DC supply to the motor. Indicator lights in green and red shows the battery is in operation and the battery condition. Battery Charger: A managed 24 volt 300MA charger is provided. Controls: "UP" and "DOWN" buttons are located on the front of the bath lift. A sealed hand control with "UP" and "DOWN" buttons is also provided. Belt Reversal: The Bath Belt is designed with an anti-belt reversal mechanism. Handle: An integral handle is provided but this can be removed or re-sited as required. 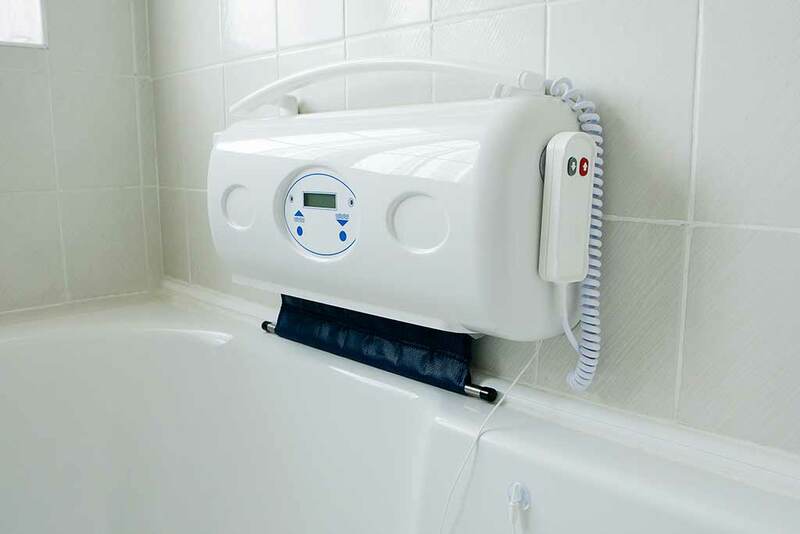 Provides independence for those that find the bath difficult to enter or leave. Feed out the belt and locate it on the floor mounting bar and tension using the hand set. Sit on the belt and by using the hand set be gently lowered into the bath. Relax and enjoy the luxury of a good soak on the bottom of your bath. Using your handset gently raise yourself out of the bath. Fitting to a solid brick wall with sound tile or plaster finish. The wall plate has six projecting studs which have provisions for screws, bolts or other suitable fixings to pass through the centre of the stud to secure the wall plate firmly to the wall. The chassis back plate is machined with six keyhole slots which allow this steel plate to slot tightly down over the projecting studs. Both plates should finally be fit together flush and level at the bottom edge. The bath lift should finally be fitted 130mm from the top of the bath to the centre of the first line of securing screws. Floor mounting bar then to be fitted to the floor. Because it is imperative that the installation is carried out safely and correctly, it is strongly recommended that this work be undertaken by an experienced professional familiar with building construction. A really good product which has helped my mum loads but the service from Active Mobility was brilliant . Up front pricing no hard sell and kept well informed all the way . I bought this for my mum and while searching we came across some very unprofessional sales tactics , one company took just under £1600.00 from my mum for the exact same product , scandalous behaviour and we still await the refund 2 weeks on . Some companies wouldn\'t even give a price without a home visit just so they could push for a sale , not good at all , for these reasons I highly recommend Active Mobility . Love it! At last I can reach the bottom of the bath safely. Not too much trouble to install and well worth the money. Good morning/afternoon, Would you please get a message to \"Tracey\" for me. Will you tell her, I have just received the new \"Front Cover\", as a replacement for the one that is broken on the \"Active Bath Lift\", that we have just purchased. What a service you have done! I only spoke to Tracey yesterday, and it is here today, just 24 hours later! Thanks again for all your help, I am going to get the item fitted some time over the next few days. Please let me know, if the company that supplied everything, wants the old damaged cover back? I will keep the box and packing for some time, but can you let me know if they want it back, or not, and I will dispose of it if necessary. Thanks again for your fantastic help. Best regards . Very good service, very good price. When I received the item it had been damaged in the manufacturing process, in 2 days I had a replacement part and was able to fit the Active Lift, fantastic service by Active Mobile staff. One fault (not Active Mobility's) there are "No Screws Supplied" for fitting? The manufacturer tells you the sizes required in the leaflet supplied with the Lift, why not enclose a £1 worth of screws to make the kit complete? ? Overall very satisfied. Thanks very much. Sensible product, clear website entry. For a product with no variables, everyone will surely pick the cheapest available.